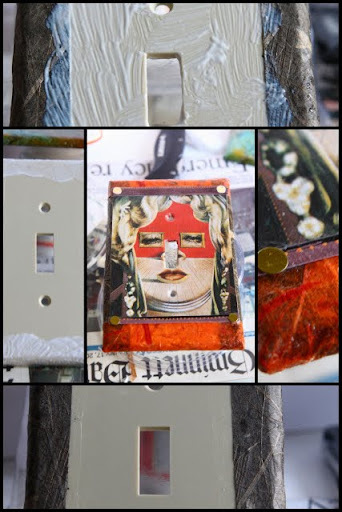 Mod Podge. Love it! Super Fan I am. Years ago when we moved into our home I wanted to add a special touch to the walls. Something different. I decided to add some art in unexpected places. Switch Plates! Now that would be a conversation piece. Many different types of papers can be used. I bought some textured art paper and pulled out my old Dali Calendars.They turned out great and I was thrilled with the results. After living in the house for nine years I was ready to redecorate several rooms in the house. 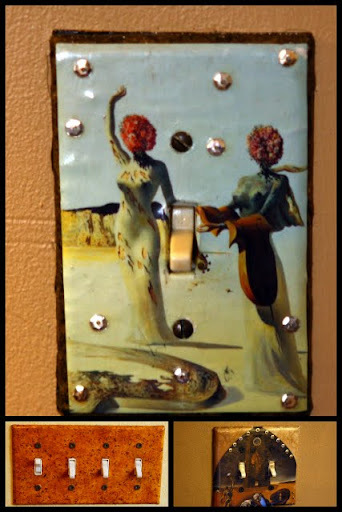 First came paint and next came the decorative switch plates. Arrange cover on paper and leave room around the edges so you can fold the paper behind the cover. I brushed two coats of Mod Podge on the top. Place cover face down over the paper. Use Exacto knife to make a small cut in the middle for switch. Fold paper back and apply more Mod Podge to secure it to the cover. 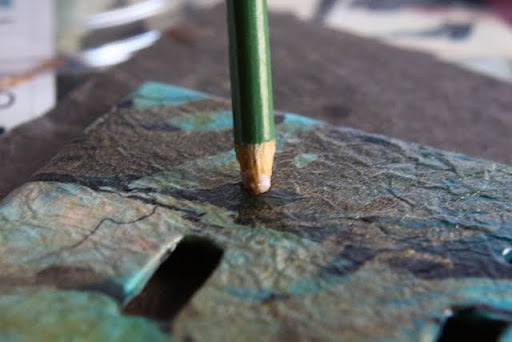 Use the pencil and gently rub around the rectangle to smooth the paper out. Make cuts and fold over the back of the cover. Brush Mod Podge all over the back to secure the paper. I set the cover on a container so the sides would not stick to the newspaper I was working on when the cover was drying. After it is dry, flip over and add two layers of Mod Podge to the front. When the front is dry, use the pencil to poke holes for the screws. Here is a second one I did using layers of a Dali calendar. I added some sparkle to this one! When both covers were completely dry I used Low Odor Clear Finish to protect them. I did not want to use the white screws that came with the cover since they would not match the artwork. It had to match! I went to Home Depot looking for “artsy screws” and the nice gentleman at Home Depot looked puzzled when I tried to explain to him what I was looking for. We came up with these screws in Brown which worked well. This beauty is in our downstairs bathroom. See how those Brown screws fit really well? These are the covers I did nine years ago! I wanted you to see that they hold up very well. All of these covers are in high use areas. I added sequins and sparkle paint to some of the covers. If you use sequins add a small drop of Mod Podge to where you want the sequins placed and use tweezers to place it on top of the drop. You will spray with the clear coat to set it when the whole cover is finished. I still have a few more covers to make and I am still working on my bedroom makeover. That’s new paint you see on the walls. They were Burgandy before! Now, what to do with that mirror?